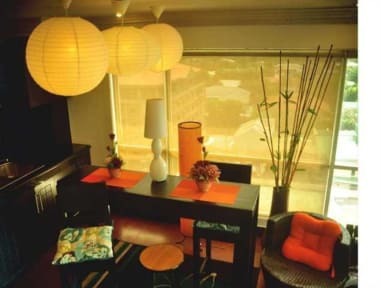 Conveniently located at the centre of two bustling party districts, Makati and Bonifacio Global City, The Fort Hotel promises to be your perfect starting point around the must sees of Metro Manila and beyond. We are just a few minutes away from the shopping centers, offices, embassies, bars and clubs, museums, and other establishments. This budget hotel is located right in the city center at a very reasonable price! 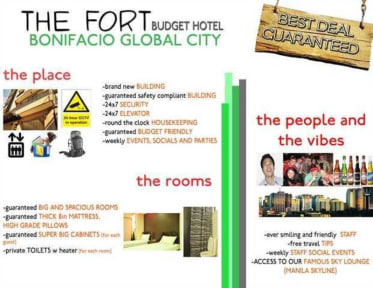 The Fort Budget Hotel is located in a brand new building (not a converted house) with 24-hour security guards, and 24-hour elevator service. Each room is as big as 40 square meters, very spacious and well ventilated compared to other hostels!